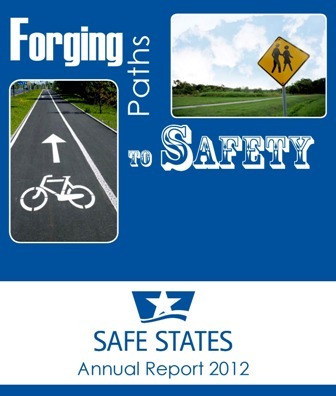 Each year, the Safe States Alliance recognizes and honors members for their contributions to Safe States and their commitment to the field of injury and violence prevention. In 2013, during the National Meeting of the Safe States Alliance and SAVIR, Safe States Alliance honored the following members for the association’s prestigious awards. It is of vital importance to recognize new professionals making strides in the discipline of injury and violence prevention. The Rising Star Award recognizes individuals who have been working in the field for less than five years. The only award selected exclusively by the Safe States Alliance membership, the Innovative Initiative of the Year Award is presented to a Safe States Alliance member who has implemented a truly unique and creative program or activity that has the potential to substantially decrease injuries and violence in the communities that they serve. 2013 Winner: Colorado Office of Suicide Prevention, Cactus, and the Carson J Spencer Foundation for "Man Therapy." This award acknowledges the contributions of an organization or sponsor for furthering the mission of Safe States Alliance. Such contributions would include, but not be limited to, providing financial support for Safe States Alliance activities or by providing states with injury prevention funding or equipment (e.g., bicycle helmets, child safety seats, etc. ), or through significant partnership and collaboration throughout the past year. This award is presented to a member who has been instrumental in assisting the Safe States Alliance President in achieving the organizational priorities of Safe States Alliance. In honor of the vision and outstanding contributions of Safe States Alliance’s first President, this award recognizes a member who has made a significant contribution to the field of injury and violence prevention in one of two ways: (1) by developing and/or implementing an outstanding statewide injury and violence prevention program, or (2) by providing outstanding service to the Safe States Alliance. 2013 Winner: Summer Institute on Principles and Practice of Injury Prevention and particularly recognize the work of Sue Baker, co-founder of the Institute, Dr. Andrea Gielen, Director of the Center for Injury Research & Policy, and Dr. Carolyn Cumpsty Fowler, Academic Director of the Summer Institute. In honor of the 20th anniversary of the Safe States Alliance, we reflected on our past presidents since 1993, and brought them all on stage for special recognition. Thank you, Ellen Schmidt, Jeff Simon, Sue Mallonee, Carl Spurlock, Mark Johnson, Alex Kelter, Trisha Keller, Susan Hardman, Shelli Stephens-Stidham, and Linda Scarpetta.